2002 Correct Craft/Nautique/Ski Nautique Nautique Super Sport,Like new, super clean sport boat with very low hours (219). 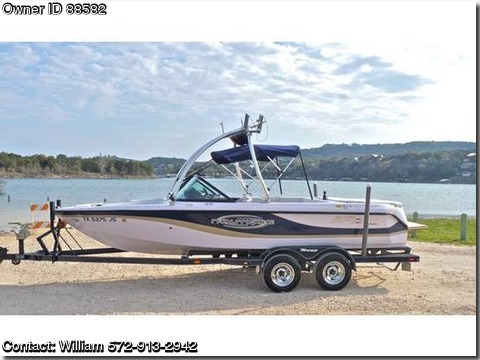 Comes with a spare prop and new bimini top. Trailer has new tires with less than 100 miles on them. Brand new $3,000 stereo with 12" sub-woofer, Kicker tower speakers and new detachable face head unit with iPod hookup. Rigged with multiple batteries and battery switch which make it an ideal boat for partying in the cove or blasting music while you wakeboard. Wake and surfboard tower racks included. Equipped for freshwater shower and fat-sacks (not included) to make a perfect wake. For the life of the boat, all service/maintenance performed at Sail & Ski in Austin and all service/maintenance records are available. This boat has been stored out of the water in a covered storage unit.